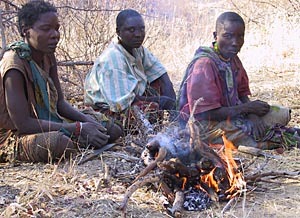 Roasting tubers, as shown in this photo of Hadza hunter-gatherers in Tanzania, enhances their digestibility, according to anthropologist Nate Dominy. Photo by N. Dominy. Anthropologist Nathaniel J. Dominy of the University of California, Santa Cruz, has advanced the investigation of the diet of early human ancestors by painstakingly measuring the mechanical properties of the underground parts of nearly 100 plant species across sub-Saharan Africa. Call it the "chewability factor" if you will, but determining the relative toughness and hardness of rhizomes, tubers, corms, and bulbs was the next step in Dominy's exploration of the hypothesis that our earliest ancestors may have eaten a diet rich in plants, specifically their carbohydrate-rich underground storage organs (USOs). The flat, thickly enameled molars of early humans have led scientists to infer that their diet consisted primarily of hard, brittle foods, with recent evidence suggesting that USOs played a key role as "fallback foods" eaten during times of scarcity. "This was the first time anyone has measured the properties of these hypothetical foods to see if they match what we've been inferring from the fossil record," said Dominy, who field-tested the hardness and toughness of 98 species of USOs. "Our data for bulbs and corms fit most researchers' expectations for the physical properties of hominin foods. What we found in some ways merely confirmed the obvious." But Dominy's new study, published in the online edition of the journal Evolutionary Biology, also adds unexpected insights, because his analysis suggests that different hominin species relied to varying degrees on USOs. Particularly when combined with other lines of evidence, Dominy's newest findings fill an important empirical void. The study marks the third avenue of investigation Dominy has employed in his pathbreaking research on diet and human evolution. Dominy has drawn on the fields of chemistry, molecular biology, and genetics to explore the source of the nutritional bonanza that gave early human ancestors an edge over all other primates. His contributions include the revelation that humans are uniquely adapted to digest starch and the resolution of a conundrum that bolstered the USO hypothesis by confirming that USOs leave the same chemical signature on tooth enamel as grass does (see earlier press releases about starch and USOs). In the new paper, entitled "Mechanical Properties of Plant Underground Storage Organs and Implications for Dietary Models of Early Hominins," Dominy tested USOs, which plants use to store water and carbohydrates. His data establish rhizomes as the toughest, followed by tubers, corms, and bulbs (familiar examples of which include Bermuda grass, potatoes, iris, and onions, respectively). Corms and bulbs emerged as the most plausible hominin foods, according to Dominy, because their physical qualities match up with dietary inferences based on dental morphology and modern chemical isotopic analysis. The new data also allowed Dominy to correlate plant characteristics with the dental morphology of different species of hominins. The teeth of Australopithecus, for example, appear well-suited to process bulbs, while the teeth of Paranthropus appear well-adapted to process hard and brittle corms. Finally, prompted by his own observations of Hadza hunter-gatherers in northern Tanzania, Dominy also conducted a pilot field study of the effects of roasting by Hadza on the toughness of five tuber species. The results, that roasting lessens the work of chewing and thereby enhances digestibility, add to the plausibility of relatively tough tubers in the diet of hominins. Dominy's coauthors on the paper were Erin R. Vogel, an associate researcher and lecturer in anthropology at UCSC; Justin D. Yeakel, a doctoral candidate in ecology and evolutionary biology at UCSC; Paul Constantino, a postdoctoral associate at George Washington University; and Peter W. Lucas, a professor of anthropology at George Washington University. Note to Journalists: Dominy may be reached at (831) 459-2541 or njdominy@ucsc.edu.